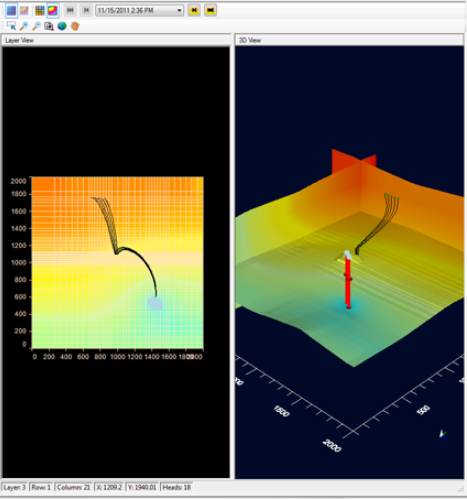 Visual MODFLOW Flex includes options to adjust the Pathline travel time and time marker for a MODPATH or a MOD-PATH3DU particle track run (using either forward or backward particles). If you ran a particle tracking simulation, you will see Pathlines appear as a new node (per particle group) in the tree under Output; add a check box beside the Pathlines to display these in the active 2D/3D Viewers. The pathlines delineate the flow path and travel time of groundwater particles due to advective groundwater flow (as calculated by MODPATH/MOD-PATH3DU). The Pathlines Map is a little different from the other map types because it does not simply represent a “snap-shot” in time. Pathlines represent a historical travel log of the groundwater particles. Forward tracking pathlines are used to predict where groundwater is flowing, and how long it will take to reach a given location if it starts from a known location at a known time. Backward tracking pathlines are used to predict where groundwater at a given location and time is coming from, and how long it took to get there. The "Pathlines Options" can be launched by right-clicking on Pathlines from the model explorer, and selecting "Pathline Options". The following window will appear (note that forward and backward pathlines can each have their own settings defined in the Options window. 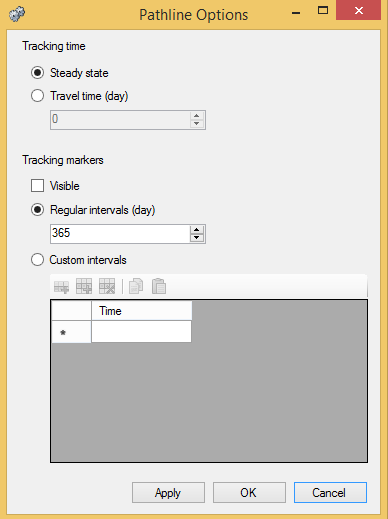 The Tracking time frame is used to select either Steady state pathlines (for all times), or to specify a maximum Travel time for all pathlines. The Time markers frame is used to hide/show the pathline time markers (using the Visible checkbox), and to select the time intervals for each time marker. The Time markers can be plotted at Regular time intervals, or at Custom intervals selected by the user. The pathline color and thickness can be adjusted in the Settings window; right click on the Pathlines object from the model explorer and select Settings. If forward tracking pathlines do not appear for some particles, check to make sure the particles are not assigned above the water table elevation, or in dry cells. If backward tracking pathlines appear to ‘skim’ along the surface of the water table instead of exiting through recharge, check the MODPATH Discharge Options or the MOD-PATH3DU IFACE inputs in the translate section to make sure the recharge flux is being assigned to the top face of all cells instead of being treated as an internal source/sink. Pathline and time markers can be exported to shapefiles for further analysis; right-click on the Forward or Backward Pathlines on the model explorer, and choose Export. A points shapefile will be created for the time markers, and a polyline shapefile will be created for the pathlines. The exported files will utilize the pathline options you have currently defined in the view for the tracking time and time marker frequency.